A parfait wouldn’t be perfect without PRANA chocolate bark and a crunchy walnut topping. Finally, a dessert that you can enjoy at breakfast or as a snack! Pretty wonderful, huh? In a bowl, combine the oatmeal, grated coconut, walnuts, coconut oil, maple syrup and salt. 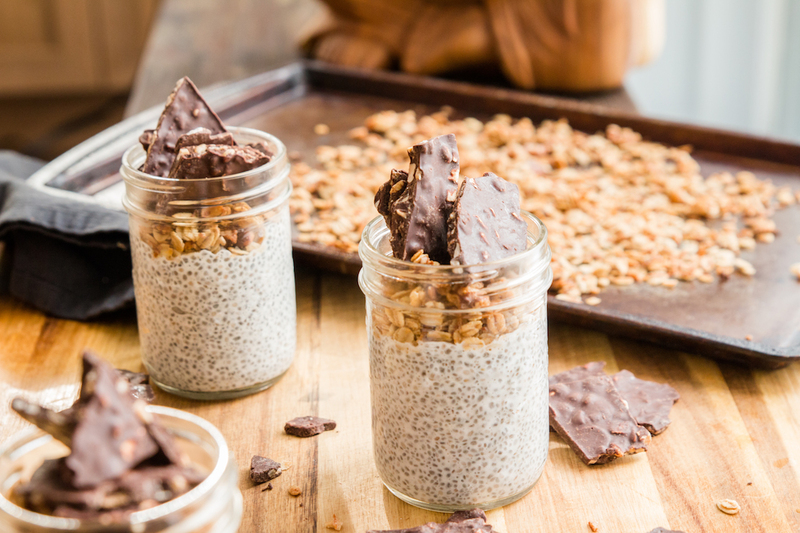 In a bowl, combine the coconut milk, the maple syrup, the vanilla extract and chia seeds. Mix well and refrigerate for at least 60 minutes. Pour the pudding into dessert cups, garnish with crumble and chocolate barks. Looks delicious. Where did the chocolate come from (garnish)? This look amazing! How many servings does this make, though? Calorie count on this without the chocolate bark? Hello your recipes are so delicious I I love them, my favourite is chickpea curry and chia seed pudding. You recipes are available in a cooking book? I live in Italy.